TBE is the abbreviation for tick-borne encephalitis (TBE). The TBE virus is especially in southern Germany, especially in the eastern Bavaria, Switzerland, Austria, Scandinavia and the Balkans. If an infection takes place, after an incubation period 4-14 days, illness with flu-like symptoms with development of meningitis (meningitis) or encephalitis (brain inflammation) with frequent partial recovery and a mortality rate of 1 to 2% can evolve. Passive immunization after infection is only possible in the first 96 hours, then it is no longer effective. Protection is only active immunization: TBE vaccination. People in risk areas should be vaccinated (Switzerland, southern Bavarian Forest, Black Forest, western Lake Constance, Odenwald), especially patients who frequently stay in the forest or with occupational risk (eg forestry workers). Immunization is 3 x (1 x in the interval of 2-6 weeks, 3, 6 months after vaccination). The duration of immunity is at 3 years old. It is a bacterial infection caused by the bacterium Borrelia burgdorferi, which is transmitted by the tick Ixodes ricinus. 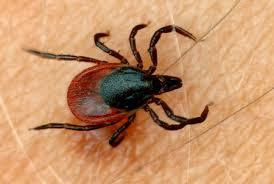 The prevalence of ticks is regionally very different and is 5 – 60%. 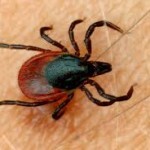 In case of illness, first develop nonspecific constitutional symptoms such as headaches, joint pain, muscle pain, gastrointestinal discomfort and possibly fever, then a rash develops at the tick bite site (erythema chronicum migrans: ecm), which spreads centrifugally. In the 3. stage joint disease, skin shrinkage, brain and nerve disorders. There is unfortunately no vaccination. 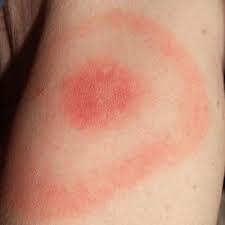 Because of the high infection rate, the antibodies against Borrelia in the blood 6 weeks after a tick bite should be determined. In any case, diagnosis and therapy of erythema chronicum migrans (redness around the stick center) occurrence must be performed. Treatment is possible and mostly successful here with antibiotics.